Whether you’re a homesick Nova Scotian, a once or future visitor to our sweet province, or a current resident, we hope you enjoy our collection of Nova Scotia photos. It started life as a wedding present on a floppy disk in 2000, and look at it now, with its own domain, a growing collection of photos of NS, a regularly updated blog about living in Nova Scotia, its own Nova Scotia Gift Shop with Nova Scotia t-shirts and gifts, and photos on Google Earth. Please feel free to link to us or share this site with others. We didn’t design the Nova Scotia Photo Album specifically to promote tourism, but we hope it will encourage you to visit the province and experience its hospitality first hand. 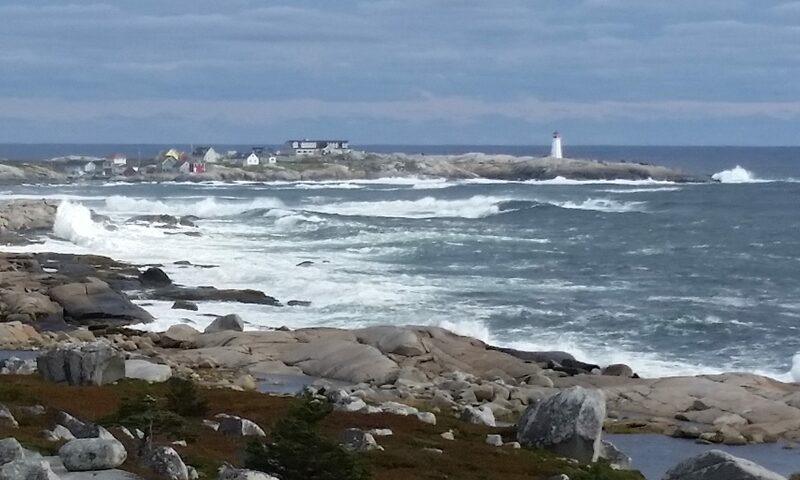 If you’re from Nova Scotia and live elsewhere, or if you have visited, you will appreciate our year-round point of view. I’m Heather Holm. I was born and raised in Nova Scotia. After high school I lived, studied, worked and travelled in New Brunswick, West Africa, Montreal, Europe, Mexico and Central America before returning to Nova Scotia in 1989. You can guess that I think it’s a great place to live! I know the province well, having lived in several of its regions and visited most others for business, performance or vacations, and by car, bike, canoe and sail. I have been running my own web design business, HolmPage Productions since way back in the 20th century. My husband, Etienne (Steve) Sepulchre, who takes some of the photos, was raised in Africa and Belgium and lived in Thunder Bay and the Ottawa/Hull area before moving to Nova Scotia. He has a professional blog on legal and regulatory issues at RegulatoryAid.ca, a French blog on sailing at VoilePourTous.com as well as an English blog on Civil Aviation, CivAv.com. 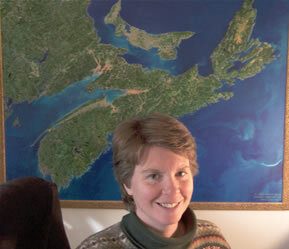 Together we have lived in Blomidon and Kentville, and now live near Mahone Bay. Our son is also a contributor to the Nova Scotia Photo Album now. Some of our photos were taken by our friend Dennis Robinson, my late mother June Maginley, and by Heike Ortscheid, a German friend who loves to visit Nova Scotia. Nothing fancy. Some of the earlier photos were taken with a 1-megapixel Agfa digital camera. You may be able to spot some of those, but others might surprise you. Other photos were taken with my dear old Minolta SLR which has bit the dust. Most of the rest are from Kodak point-and-shoot cameras or a Kodak P880. In January 2011 I had the temporary use of a Fujifilm FinePix S1800. I think that the most important part of a camera is the lens, and lens quality and price are not necessarily related. The other part of taking a picture is the human eye, and there’s no price tag on that. It’s too bad they’re not making cameras anymore, though bargains can still be had. Any of the photos on the “Nova Scotia Photo Album” web site may be used on non-commercial web sites with acknowledgment and a link back to the homepage of this web site on the same page that the photo appears. The link can be as simple as “H. Holm photo, Nova Scotia Photo Album” with a hyperlink to http://www.NovaScotiaPhotoAlbum.com. The link must be visible and legible to the naked eye. Photos may be used on commercial web sites for illustrative purposes with the same provisions as for non-commercial use above. However, they may not be sold or transformed into an item to be sold without a contract with HolmPage Productions. If not otherwise indicated, photos were taken by and are Copyright © H. Holm. Note that the photos on the site are low-resolution images and would not be suitable for any purpose other than internet use. If you need high-resolution images for a printed project, please contact me using the form below. I do need to charge a fee to cover the work involved in retrieving and sending the files. Not all the images on this site would be of a suitable resolution for print. So be sure you are serious before you inquire about high-resolution files. Thanks. Please feel free to leave a comment below, or after any posting on the Blog. Comments are moderated, so you won’t see your comment appear right away. Thanks. Thanks, Cheryl Lynn, of course it’s OK! And I hope to take more photos of the wonderful Eastern Shore soon. Best wishes. Lois – yes: a male has been spotted in two locations in the Blomidon area. Did you see this post and photos: http://www.novascotiaphotoalbum.com/blog/2009/04/indigo-bunting/ (note the comments as well)? Some Gorgeous shots you have there! I am from Scotland and my Fiance is from Nova Scotia and we both live in NZ. We plan to move to Nova Scotia in a few years time and seeing these photos want me to move even quicker! I was just looking at your photo’s and you have some great ones! You have one of Blomidon that I especially like and I’m wondering if I might be able to use it as a background for bicycle hang tags in my store in Wolfville? I plan to have information on these tags about each bike that we have on the floor for sale. I was thinking it would be great if I could have a local landmark on the tags rather than just having plain old black and white ones? I love your photography. I’m just back from a trip to Nova Scotia and I’m missing it already. I would like to use one of your photos (one of the winter roads in “Photos of Cape Blomidon’s moods”) as a jumping off point for a painting (my style veers a bit towards abstraction). While I don’t sell my paintings yet, I may do so in future. How do you feel about visual artists using your work in this way? I’d love it! Consider sending me a photo when it’s done, and I’ll add it to the blog, with contact information. I have a blog called “Travel to Nova Scotia.” It is a hobby blog and I would like to feature some of your great photos. I have already linked back to you. Thanks for creating such an amazing resource! I’m a misplaced Nova Scotian now living in Montreal and desperate to come home. I so enjoyed your website and the gorgeous photos of home. My sister lives in the Annapolis valley near Blomidon and my folks are on the south shore (Cape Island). I go home every chance I get and will be sure to let everyone I know that they absolutely have to check out your site – great job! Keep up the awesome work. Be back from time to time whenever I get homesick – which is often. Glad you found the site! You’re just the kind of person I often imagine when I’m working on it – the homesick Nova Scotian – and there are a lot of them out there. Hope you get to move back soon! I see that we are able to use the pictures as long as we link it to you. I work in Public Health in Wolfville and we are in the process of doing a cook book to help promote local fruit and vegetables for children and familities. We had one picture in mind for the front cover (it is the one from the Look Off, looking out over the fields – absolutely stunning by the way). We will probably print enough that we are able to sell them. Are we able to use this picture. Please let me know as soon as possible so that we can get on with the printing of this important cookbook. Hi Marsha, I will e-mail you personally with more information. If you are going to print the photo, you will need a higher resolution version, or it won’t look good at all. What works on a computer monitor is not good enough for print. I’ll be in touch. Yes, I’ve thought of adding watermarks to photos. I’ve procrastinated for a long time… Anyway, I’ll send you an e-mail directly. Awesome site and great pics of my old stomping grounds. Real Bluenoser here and I am now landlocked in the middle of Canada. No “real” fish here, pickerel just doesn’t compare to pan fried mackerel hehe. I found your site via Google while searching for pics of the southshore. I am gearing up to move back east in a year or so and working on a business site for myself. I would be interested in using one of your photos in a site banner. Pllease email when you have chance and I will give you some details on what my site is going to consist of and the image I wish to use as well with your permission. Thanks Dale, I’ll e-mail you directly. Good luck with your business! Hi Heather, really enjoyed all stories and photo’s! In 2008 we (husband, 2 kids and me) spent two weeks on Nova Scotia and we loved it. We hope to be back soon. Till then this site will keep our memories alive. Thanks, Erna! Hope you can come back to Nova Scotia soon! What a great website! Some fabulous pictures! My girlfriend and are from Halifax, and now are working in Alberta, but are dying to get back home. I guess moving away really make you realize what Nova Scotia really has to offer. My dad’s side of the family is from Mahone Bay and it is truly one of my favorite places in Nova Scotia. How did you like living in Kentville? I’d be curious to hear your thoughts about that! Thanks, Dave, glad you enjoy the site. About living in Kentville? It’s a fair-sized town with a variety of areas, subdivisions etc., so it depends where you are… and who you know. My social life had always been centered more around Wolfville, so it wasn’t my first choice. But we were in a really nice neighbourhood (look for Klondyke St. in Google Maps) walking distance from downtown, with great neighbours. It felt like a special little corner of the world. In the end, we moved from there to be near the ocean, as sailing was a major interest. Hope you get to move back to Nova Scotia soon. We have created an educational and conservation based website, http://www.JUNPonline.com. Nature focused photographers like yourself can document and share Nova Scotian wildlife sightings here in a public database and promote their own website (novascotiaphotoalbum.com) at the same time. We provide a free account/webpage which can promote your website, listing details of your organization alongside submitted wildlife sightings. Any submitted photographs can include a watermark credit and are linked to your account page. I hope your find the website useful for documenting Nova Scotian wildlife sightings to share with the public and to promote your organization. If you have any questions please contact us anytime. We would like to use some of your photos for a commercial purpose but need higher resolution than provided on your site. Would appreciate it if you would email us so we could set up a phone call to discuss. Really am impressed with your website, and your photography. Know you must miss the Valley, we live in Kentville. Can I tweat your site or make a link to it…great stuff. I have an image of a painting that I believe is Mahone Bay and I would very much appreciate your comments on it. Can I contact you directly so that I can send you an image of it or is there a way of attaching it via this contact box? My name is Ann-Marie, I am a realtor here in Halifax. I am originally from Ireland and I am currently writing an article for a British Magazine, the article is aimed at showing what Nova Scotia has to offer, “a great place to call home and raise a family”. This is an unpaid article, I am writing it to promote Nova Scotia as a place worth moving to, full of possibilities! I would really appreciate being able to use some of your photos in this article, they showcase Halifax and Nova Scotia beautifully, as a place I am proud to now call Home.